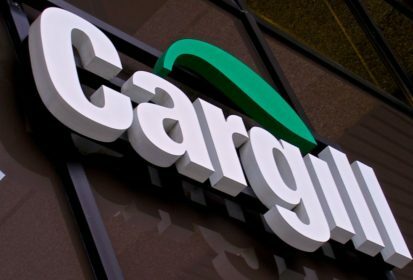 Chicago | Reuters — Strong global demand for beef and animal feed fattened grain trader Cargill’s profits in fiscal year 2018, which were also boosted by trade tensions and South American weather woes, the company said on Thursday. For the full year, adjusted operating earnings reached $3.2 billion, up six per cent from fiscal 2017 (all figures US$). Company officials said that was the highest ever, excluding earnings from Cargill’s investment in fertilizer producer the Mosaic Co., which it exited in fiscal 2011. The impact of a drought in Argentina, and volatility in financial and commodity markets sparked by trade disputes between the U.S. and top commerce partners China and Mexico, helped Cargill’s grain trading unit to its strongest fourth-quarter showing in seven years. Global demand for all proteins — whether from meat and poultry, or aquaculture and plants — is booming in emerging markets in Asia and Africa, in part due to rising incomes, industry analysts say. — Reporting for Reuters by P.J. Huffstutter and Tom Polansek in Chicago; additional reporting by Karan Nagarkatti in Bangalore and Theopolis Waters in Chicago.